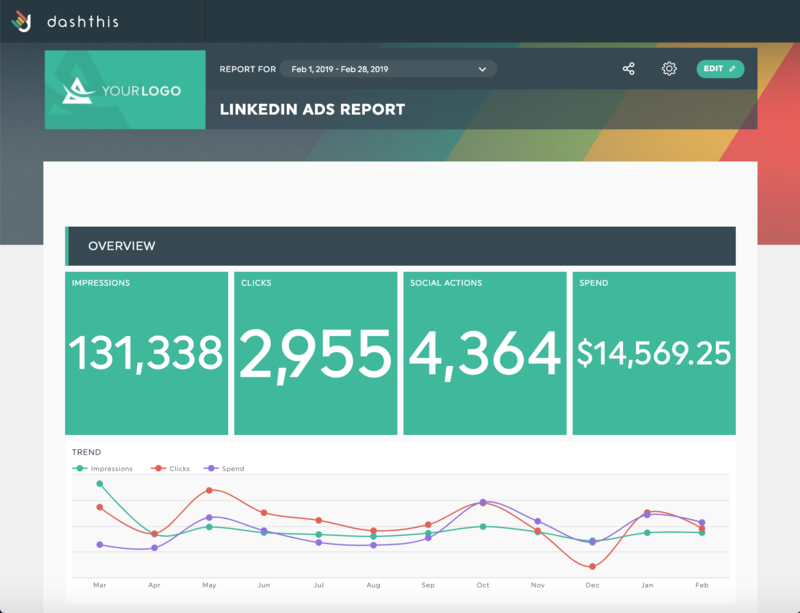 If you want to create a LinkedIn Ads performance dashboard, DashThis is the place to go! You can track the performance of your campaigns, and put data from LinkedIn Ads side by side with that of other platforms you might be using (such as Google Analytics or Facebook Ads). You can get a complete picture of your campaigns across different platforms, and therefore develop better strategies. Get the best out of your data with our PPC reporting tool! Before you connect your LinkedIn Ads account to DashThis, please make sure you’re an account manager on the LinkedIn Advertising Accounts. If you’re not, we won’t be able to connect your data. LinkedIn Ads documentation tells you how to add and remove administrators on the Company Page. 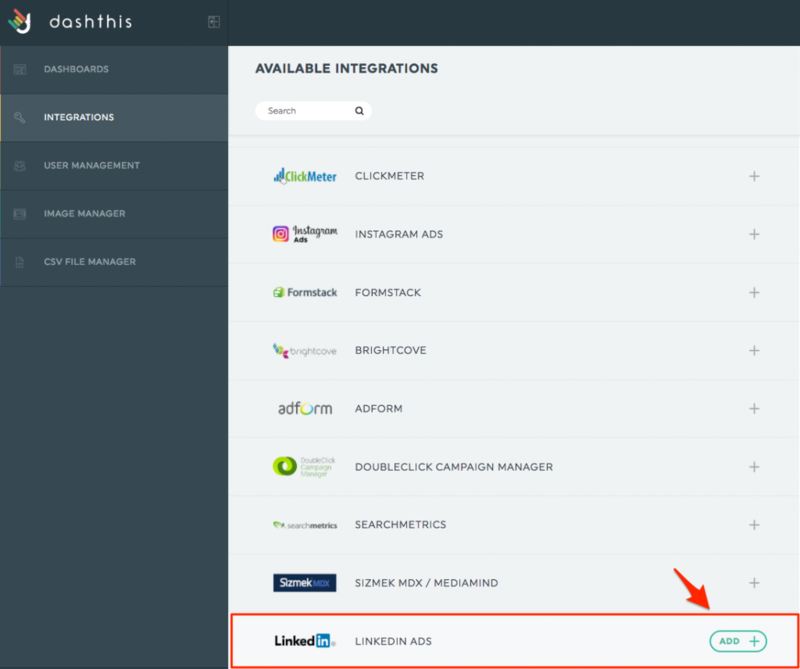 Connecting DashThis to Linkedin Ads requires 2 clicks. Literally. – In the Integration Manager, choose LinkedIn Ads and click on Add. – You’re then redirected to LinkedIn. Allow DashThis to access your information and sign in as usual. 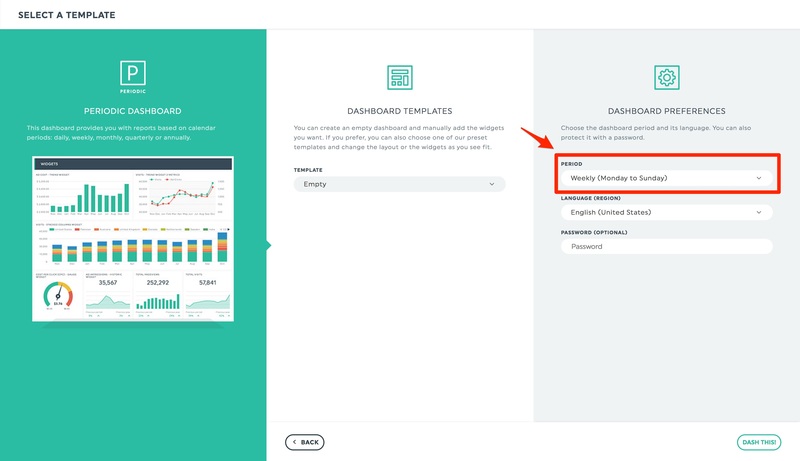 Your account now appears under the section Integrations in use in DashThis. Follow this link to see the template in its entirety and interact with it. If this template does not fit your needs or tastes, you can customize it, and even start from scratch! The data history available for LinkedIn Ads depends on the time range you choose for your periodic dashboard. If you choose a daily or a weekly scope, only 6 months of historical data will be retrieved. If you set a monthly, quarterly, or annual period, the regular 13-month default data history applies. Please note that this limitation only applies to the periodic template. How to create filters for Google Analytics?